Serve up this incredible Easter egg poke cake recipe for all your Easter entertaining needs. You have a moist cake with Vanilla pudding poked throughout and topped with sweet whipped topping! If you are looking for a super easy Easter dessert this recipe is a must make. I used a box cake mix to speed up the prep, and boy did it turn out fantastic. There is something magical about poke cakes! I opted for pudding instead of Jello for my Easter version. The vanilla pudding adds incredible creaminess to your cake and sweet flavor. The family praised me the entire time they ate this Easter cake! I knew at that moment, anytime I needed to bring a cake this was my go-to recipe. Absolutely! If you have a homemade vanilla cake recipe you love, reach for that instead of box! It is all about preference. Just make sure your cake recipe is a 9×13 pan size. Gel food colorings work great for this Easter cake. But if you don’t have gel reach for liquid. I have found brands like McCormick neon gel, they are nice because you don’t have any bite or flavor from the food coloring. Some brands I have noticed offer a tangy flavor to a dish if you add much at all. But feel free to opt for what you have on hand. Yes, your poke cake does need to be refrigerated once you finish it up. If not the pudding and whipped topping will break down and your cake will go bad. Just keep in the fridge for 3-4 days, and then at that time, you need to toss any leftover. 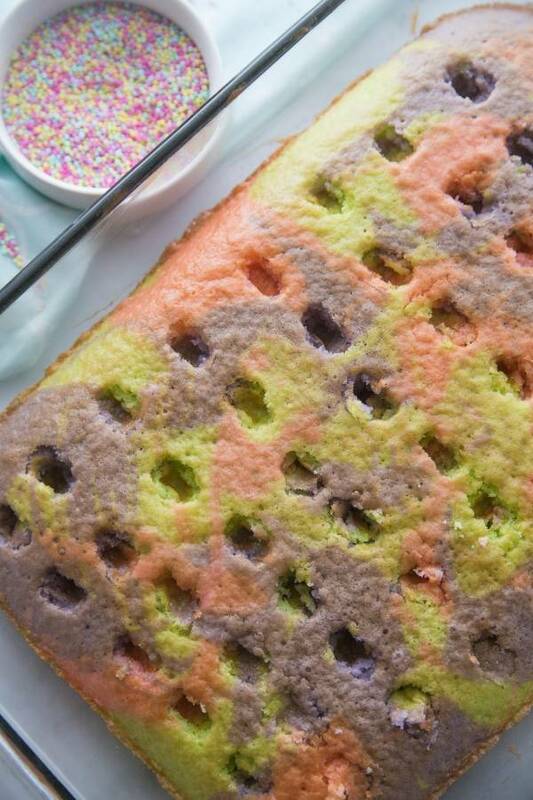 Place each color of batter into a Ziploc Bag and cut the end off. Squeeze Batter into a Greased 9×13 Pan rotating colors as you move around the pan to create a marbleized look. Pour pudding mixture over the cake and allow it to soak into the holes. Look at how pretty this cake turned out. If you are looking for an Easter cake, consider this easy pudding poke cake recipe! Colorful, creamy, and downright delcious, down to the last crumbs! Have you ever made an Easter poke cake? Making this for Easter. Looks so good.